We’ve long believed that our Food and Drink / Hospitality qualifications give students a cutting edge when sharpening their culinary skills. Now 17-year old Jamie McKinnon, a former SVQ Lv 3 Professional Cookery student at Perth College UHI, has risen to the top after winning The Chef's Protégé, a 20-part BBC2 series following three of the country’s top chefs as they returned to their former colleges to mentor budding gastronomic greats. Michelin starred-chef and former Perth College UHI student, Tom Kitchin, identified Jamie’s potential and worked with him closely throughout the series, helping him develop his culinary skills and learn the intricate techniques that set him apart from the rest of the competition. At the series’ culmination, Jamie was announced the winner following an intense final challenge – cooking for legendary chefs Pierre Koffmann, Ruth Rogers and Albert Roux. Jamie’s reward will be working with Tom at his award-winning Edinburgh restaurant, The Kitchin, where he will continue to hone his skills. Speaking about Jamie’s success, Ian Gibb, Perth College UHI hospitality subject leader said: “This is a fantastic result for Jamie. He’s constantly demonstrated commitment to his craft; learning from one of the best chefs in the business and impressing some of the culinary world’s elite with his determination to learn and improve his skills. 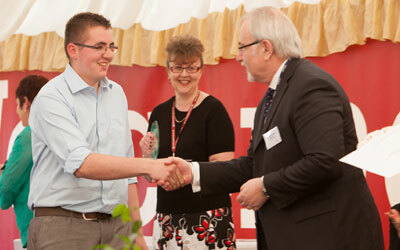 Dr Thomas Moore of Perth College UHI congratulates Chef's Protégé winner Jamie MacKinnon.